. "Hart Memorial Trophy". The Canadian Encyclopedia, 21 June 2018, Historica Canada. https://www.thecanadianencyclopedia.ca/en/article/hart-trophy. Accessed 18 April 2019. The Hart Memorial Trophy (originally the Hart Trophy) is awarded annually to the player chosen by hockey writers as being "most valuable" to his National Hockey League team. Howie Morenz, the most exciting hockey player of his era, died as a result of injuries suffered in a game. 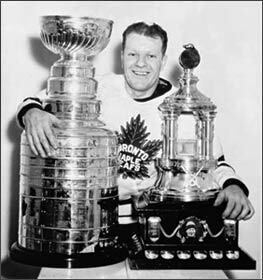 He was 3-time winner of the Hart Trophy (courtesy Library and Archives Canada/C-29495). The Hart Memorial Trophy (originally the Hart Trophy) is awarded annually to the player chosen by hockey writers as being "most valuable" to his National Hockey League team. The winner is determined through a poll of the Professional Hockey Writers’ Association. The Hart Trophy was donated to the NHL in 1923 by Dr. David A. Hart, father of Cecil Hart, who would become manager and coach of the Montreal Canadiens. The oldest and most prestigious individual award in hockey, it was retired to the Hockey Hall of Fame in 1960 and replaced by the Hart Memorial Trophy. Several players have won the award twice, including Stan Mikita, Bobby Hull, Guy Lafleur, Mark Messier, Dominik Hasek and Sidney Crosby. Howie Morenz, Bobby Clarke, Bobby Orr, Mario Lemieux and Alex Ovechkin each won the award three times. Eddie Shore won it four times, and Gordie Howe won it six times. Wayne Gretzky was awarded the Hart Trophy an unprecedented nine times, eight in succession from the start of his career (1980–87).